The City Center Partnership is excited to commence Phase II of INFUSE, part of a larger initiative called Artists on Main Street, a partnership between Minnesota Main Street and Springboard for the Arts with support from the Bush Foundation. This initiative explores the intersection of arts and culture, downtown revitalization, and historic preservation in eleven Minnesota Main Street communities, beginning with three communities in its pilot year: Winona, Faribault and Mankato. The pilot years success resulted in continued investment by the Bush Foundation to include eleven communities over a three-year period. Four communities were selected to join the program in 2019 including Northfield, Olivia, Wabasha, and Willmar. Each community receives support on planning and implementing creative placemaking projects through training, one-on-one technical assistance, and cohort support to integrate arts-based problem solving. INFUSE: Artists on Main Street Mankato has received a $10,000 grant to employ artist-led solutions to a local challenge identified by the community. The City Center Partnership has matched the grant to provide a total of $20,000 in project support. Training and resources will be provided in partnership with Springboard for the Arts to artists who live, work and have a personal investment in the community to make positive physical, economic and social impacts. The focus of the second phase of INFUSE in City Center Mankato is activation of open spaces – specifically Washington Park located on 4th Street between Mulberry and Washington Street. Washington Park is a hidden gem within the City Center, with one of the largest green spaces and one of the most diverse neighborhoods in our downtown community. Introduce the idea of infrastructure improvements to make the space easier to use in the future. 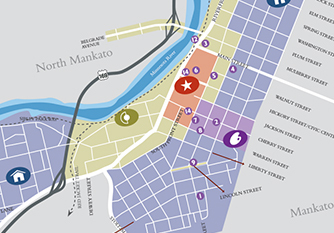 Minnesota Main Street is an economic development program of the Preservation Alliance of Minnesota (PAM) that uses a historic preservation based strategy to revitalize downtown districts in Greater Minnesota communities. The program works with communities long-term and provides training and resources, including a Main Street Project Fund, to help community members revitalize their downtown. This year, INFUSE will fund large (up to $10,000) and small (up to $1,000) projects. Projects can be temporary or permanent, performances, events, visual arts or something completely new and different. To submit a proposal, artists must attend the Artists on Main Street Workshop in Mankato (Tuesday, April 23, 5:30-9:00 p.m.) held in the DeSmat Meeting Room at Saints Peter and Paul Catholic Church – 105 N 5th St, Mankato, MN 56001.